This entry was posted in Desserts, Recipes and tagged dessert, food photography, Food Styling, Food Stylist, lebanese food blogger, Lebanese food stylist, Maya Oryan, meghleh, middle eastern food, Snayniyeh, sugared chick peas, wheat with sweet sauce by Maya Oryan. Bookmark the permalink. Well they’re optional:) Can be replaced with pine nuts! Thank you Paty! What a beautiful story! My son’s first tooth came in a few months ago, but I would still like to make this. I love how the chickpeas have taken on the pomegrenate colour! Reblogged this on KHANH HA. What a delicious exotic dessert, sugar coated chickpeas sound fabulous! Gorgeous! Thank you for visiting my blog…so glad I found you. I bought a bottle of orange blossom water and have been looking for recipes to use it…now I have one…Thanks! After looking at the recipe, I see why you would celebrate getting teeth! Having the best experience with this would require a few. You post wonderful, healthful recipes and your prose is very soulful. Lebanese culture is remarkable – thanks for the little exposure. Thanks also, so much, for joining my fun! I look forward to your visits . . . . . . . I always wondered what it was that the Lebanese made for this occasion, after a friend told me about it. She described it as a pudding and I’m really intrigued to now try this out and see how it tastes. I think Pine Nuts would be divine in this, even though less pretty. Pine nuts will sure do:) Thank you and hope you enjoy it! Maya are you on twitter? It’s a very popular snack! lovely recipe.. thank you Maya : ).. i’m preparing it for my 7 month Sofia who had her 2 lower teeth peeping up recently.. but without the pomegranate because it’s out of season now..
As you said it reflects our social structure. 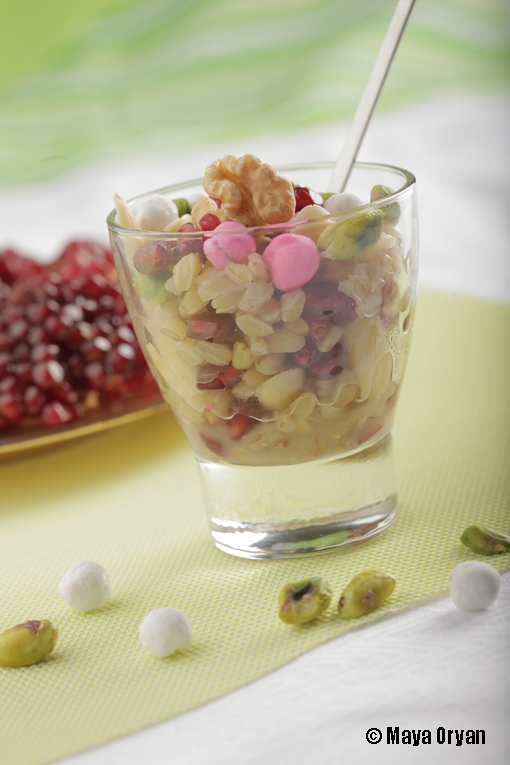 Mabrouk Sofia and enjoy the snayniyeh with or without pomegranate. Best!